You should know that smoking is a bad habit that you should break. On top of that, it is banned (in certain areas) here in Singapore. If you smoke in a “non-smoking area”, you will be fined from S$200 to S$1000. Other Singaporeans are pursuing a proposal that seeks to free Singapore from Tobacco. The proposal is to stop or ban the supply of Tobacco to Singaporeans born from 2000. This will eventually result to the phasing out of Tobacco. The basic thing that you can do is restrain yourself from smoking. You can start from taking away all paraphernalia so you will not be distracted or pre occupied. If you abstain, you will feel a strong desire or urge to smoke but you can forget it by keeping yourself occupied or busy. More importantly, you should be serious and determined to stop it. If you feel that you need the help of other people, therapies are available. Doctor’s will help you get through this. They can prescribe drugs that can assist you. Smoking is not good. Yes, it feels good for a while but as it wavers, everything will be normal again. You should think that the effects are long term. You will suffer and it is not that good or fun anymore. Stop smoking now or regret it later. It is your choice. In earlier times, when you get bad food or service from a restaurant, you either talk about it with the manager or you tell your friends not to go to said restaurant. Today, the damage badly-served customers can do is far worse: with the advent of social media, not only can they detail their bad experience for anyone to see, they can post it exactly where would-be other customers are expected to check. Understandably, this is bad news to restaurants that provide poor service as shown in the case of one Arizona restaurant. The restaurant, Amy’s Baking Co., has been infamous in its locality. They were so bad that even master chef Gordon Ramsay gave up on salvaging the establishment, a first in his popular show Kitchen Nightmares. But instead of learning from the experience, the owners lashed out at its online critics – to its own detriment. The more a restaurant cries foul and denies its faults, the more online critics will pounce on them, and the more people will know how bad they are. That was exactly what happened with Amy’s Baking Co. and many others. The power of social media is so strong today that they can make or break restaurants big and small. As evidence, a Harvard study showed that an increase in online rating directly translated to increased revenue. Poor ratings, of course, mean fewer customers. How does Singaporean restaurant fare? Not too bad at all. Customers gave perfect ratings to a good number of restaurants, including Restaurant Andre, Shinji by Kanesaka, and CUT at Bayfront Avenue. Notably, Restaurant Andre ranked #38 on the World’s 50 Best Restaurant Awards 2013. Qi Mantra Remedial Massage is located in Kim Seng Promenade. They are open from 10am to 10pm every day. Expect to pay S$25 to S$200 for their treatments. You can call them through (+65) 6836-3682. The centre offers acupressure and other specialty treatments, such as wisdom massage and shockwave puncture. You can choose from their collection of blended aromatic essential oils. Auriga Spa is located in The Knolls, Sentosa. They are open from 10am to 1opm every day. Services start at S$150. You can call them through (+65) 6377-8888. Auriga is considered a five star spa. They offer body massages, foot treatments, yoga, facials, meditation, full day spa packages and many more. They also have a famous treatment packages: Waning Moon, New Moon, Full Moon and Waxing Moon. It is a bit costly but you will surely feel invigorated after experiencing these treatments. Ayurlly Ayurvedic Spa is located in Tekka Mall. Services start at S$50 to S$200. If you want to avail of their services, you should call for an appointment. You can call them through (+65) 6737-5657. They specialize in Ayurvedic therapies like shoulder, head, knee and bust massage. Their signature treatment, and a must try, is the Chandranukhi. You deserve these treatments. Don’t think about the money or the time because when you really want something, nothing can stop you. Don’t let other things keep you from the things that you deserve. There are countless spa centres operating these days. The challenge is to find the perfect place. The wastes we give off are alarming. We should be aware that if we don’t reduce or minimize it, wastes will occupy most of our space soon. We don’t want that. Governments are now doing their best to at least minimize waste with the use of waste management programs. As citizens, the least that we can do is follow it and educate the people around us. You can start by packing your own lunch using your own containers. Avoid takeouts or other packaged foods because you can throw it away after use. You will only increase garbage in the office. If you are hosting an events or functions, avoid using disposables like lunch boxes, cups, etc. When you have long meetings or when you are out, always make sure to switch off your computer units. If lights are not needed, switch it off. Air conditioners should be set to the most advantageous temperature of 25°C to conserve energy. If it is really not needed to bring your own car, do air a favour. Minimize carbon emissions by availing of company carpool services or simply commute. If you want to be fit and healthy, you can consider cycling to work. Choose recycled paper for printing. Avoid printing unnecessarily and if it can’t be helped, print on both sides to maximize paper. 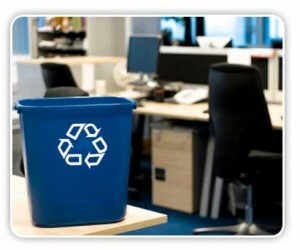 It is important that there is a system in the office that promotes recycling. Employers should be serious about the recycling system so employees will follow it. 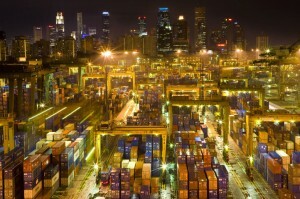 The Port of Singapore is once again the “Best Seaport in Asia”. Asian Freight and Supply Chain Awards (AFSCA) honoured the port for the 25th time. Maritime and Port Authority of Singapore (MPA) is pleased with the award saying that this award is the confirmation of the world’s strong confidence in the port. The award is attributed to the port’s cost effectiveness, new developments on infrastructures and the simplification of secondary services like logistics and freight forwarding. There are many competitions coming from ports of Hong Kong, Manila, Ningbo, Tianjin, Shenzhen, etc. but Singapore was chosen the best. Well done! Ports in general provide an important link between land and sea transport. Aside from that, ports present opportunities of jobs directly or indirectly. The Port of Singapore is considered one of the busiest ports in the world when it comes to shipping tonnage handled. In 2012, it handled 2.25 billion gross tons. What made the Port of Singapore grow? Geography wise, Singapore is the strategically located on the shipping route between India and China. Singapore is near Thailand, Indonesia, Malaysia and the whole of Indo-China. Port of Singapore is the efficient choice as a bunkering station. Port of Singapore is considered a free port. There are no taxes levied on products except tobacco, alcohol and petroleum. There are no dock, port or light dues. The commercial policy of the government that allows merchants complete freedom of trade contributed to the port’s success. Merchants love this freedom therefore increasing transactions are recorded every day.